How fast is the year going!? The weeks seem to go by so fast, then before you know it another month is over...and yep, soon we'll be saying it's almost C-r-s-m-s :-o ....which I really don't want to think about yet! I have included a couple of flourishy scrolls from the 2crafty, Design Elements pack...and I have painted them in Pistachio acrylic paint with some added sand...then I have inked in brown & also lightly sanded. Just about everything else on the page is Prima....besides the lace & Thickers. A close up of the 2crafty flourish scrolls & cluster. And my title, using AC Thickers...that I have altered with some sand mixed in brown paint, then inked & gesso'd. The photos are of the historic homestead - Highfield, near Stanley in Tasmania. It was a really interesting place to visit...oh, and great for taking photos too!! You have until the 30th of September to upload your entries for the sketch challenge to the September folder in the Scrapbook Store gallery. As always, there is a $40 store voucher up for grabs that also includes free postage! This looks super Linda, love how you altered the thickers they look awesome. Great paper choice for these photos too! WOW....you are SO clever ! How gorgeous! Fantastic job with that sketch! Beautiful products for those pictures and wonderful layering. Love the bee on the paper! Lovely sketch - can't wait for my computer to be fixed to print out some photos for this one! 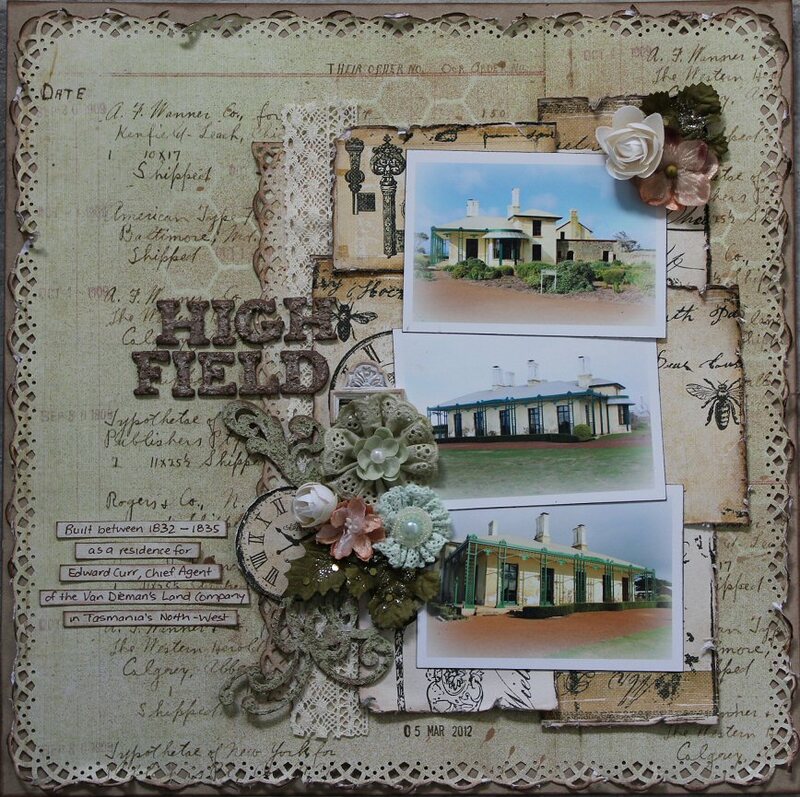 Your layout is as usual an absolute beauty full of historical/regional interest & your thickers idea is fantastic! Can't wait to try that out!! Hi Linda, not sure what is going on but just loaded my layout at HBS into the September Sketch category and the sketch is entirely different - so came back here to check and you have this one...This is the one I used.